Our cabinetry has two coats of primer sprayed in the workshop. 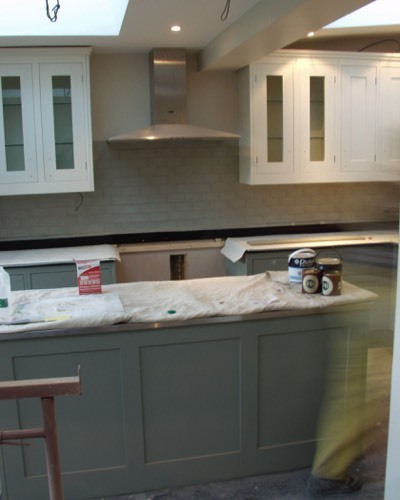 After installation, a minimum of two coats of hand-brushed Farrow & Ball Estate Eggshell paint will be applied. (We use Farrow & Ball not just because they have an excellent colour range, but because their Estate Eggshell dries very quickly and leaves a superior clean surface.) We then apply a coat of clear lacquer which gives a very tough smooth finish. The protective lacquer is invisible and makes cleaning much easier. (Note: some kitchens companies will spray their kitchens in the workshop before installation. This may be quicker initially but does not produce such a high-quality finish. Also, if the kitchen gets damaged, it is much more difficult to repair.